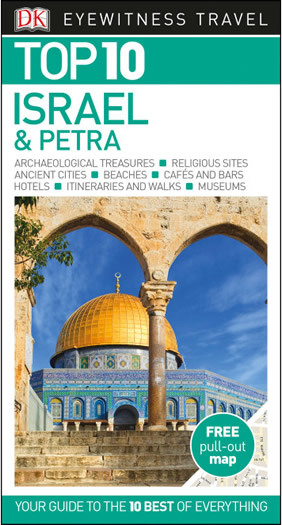 Experience the exquisite panoramic views from the Mount of Olives; Travel back in time to the beautiful Old City through one of its Ancient gates and visit such historical marvels and spiritual landmarks as King David’s Tomb and the Room of the Last Supper, the Church of the Holy Sepulcher, Via Delarosa, the Arab Market and the recently restored Roman Cardo. 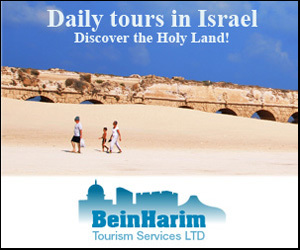 Find yourself wandering through the charming Armenian and Jewish quarters, and see the sacred Western Wall, standing for thousands of years, before continuing on to the Christian quarter. End the day with a bang; a spectacular Sound and Light show exploring the rich history of Jerusalem projected on the Old City walls. Kick off your morning with an OUTstanding Travel representative. 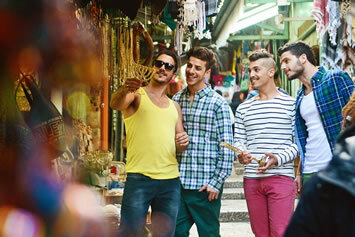 Feel free to enquire about our superb Gay community and experience Rothschild Boulevard, one of Tel Aviv’s most important and iconic streets. 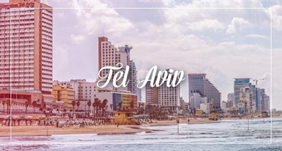 Located in the heart of the White City of Tel Aviv, Rothschild Boulevard is a commercial center, with major financial institutions lining the street, a cultural center, with the main theater and concert hall of Tel Aviv, a culinary center, with tens of top restaurants, and a leisure center. Visit the lovely Neve Tzedek, the first neighborhood of Tel Aviv, built in 1887, and the historical sites of Old City Jaffa, one of the oldest port cities in the world; soak up the ancient ruins and walk along the Artist's Quarter. We pride ourselves on our knowledge of the nightlife and exquisite culture with our unique Gay perspective. 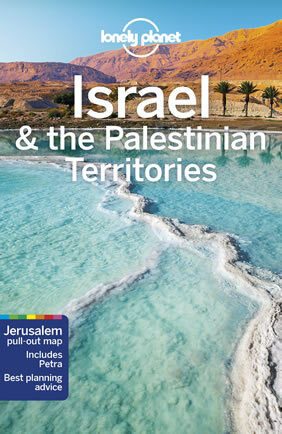 Select from 4 different Jerusalem & Tel Aviv hotel combinations. Situated on the beach in Tel Aviv, Carlton Tel Aviv is close to Tel Aviv Marina, Hilton Beach, and Nordau Beach. Additional attractions near this luxury hotel include Gordon Beach and Metzitzim Beach. Carlton Tel Aviv has a marina, an outdoor pool, and a health club. Complimentary wireless Internet access is available in public areas. Dining options at this beach hotel include a restaurant, a coffee shop/café, and a poolside bar. Additional amenities include a rooftop terrace, spa services, and a sauna. Rooms open to balconies. The 280 air-conditioned guestrooms at Carlton Tel Aviv include minibars and safes. Guests can use the in-room complimentary wireless high-speed Internet access. Televisions are equipped with cable channels and pay movies. All accommodations provide desks and phones. Bathrooms offer hair dryers and complimentary toiletries. In addition, housekeeping is offered daily and amenities available on request include irons/ironing boards. Just a few steps from Tel Aviv's beach, Shalom Hotel & Relax offers a rooftop lounge overlooking the city and Mediterranean Sea. Free Wi-Fi access is available throughout. Relax in a sophisticated Tel Aviv hotel styled as a beach house. 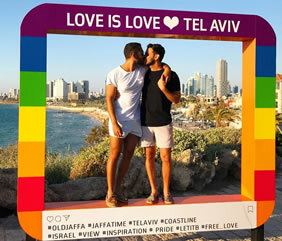 Enjoy the cool breeze and beautiful sunsets in the heart of the city, overlooking the Tel Aviv beach. The hotel is a 10-minute walk from Tel Aviv's shopping district around Dizengoff Street. Tel Aviv Marina is just 5 minutes away on foot. The Shalom Hotel & Relax offers 51 rooms designed to pamper guests that want to enjoy the resort atmosphere of Tel Aviv, Israel. Shalom Hotel & Relax - an Atlas Boutique Hotel has been completely modernised. Each room is air conditioned and features a plasma-screen TV with internet access and cable channels. The rooms have sea or city views. All guests are welcome to enjoy the amazing rooftop lounge - the perfect spot for an afternoon of relaxation. Situated near the beach, Cinema - an Atlas Boutique Hotel is in the heart of Tel Aviv, within walking distance of Dizengoff Square and Dizengoff Centre. 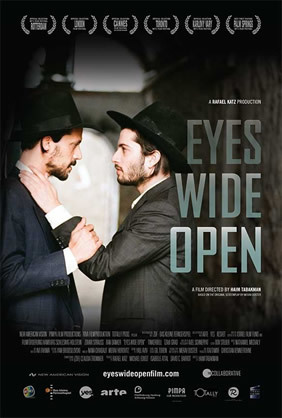 Also nearby are Habima Theatre and Frishman Beach. Cinema Hotel - an Atlas Boutique Hotel was a former cinema and the movie theme remains throughout the hotel. The hotel's unique design, complemented by some of the original projectors and movie posters, preserves the legacy of the building. Classical movies are screened in the hotel lobby and popcorn is served – all to heighten the nostalgic and unique atmosphere. The Cinema Hotel features a beautiful rooftop terrace overlooking Dizengoff Square, a business lounge serving complimentary afternoon and evening refreshments and snacks, use of a nearby gym for a moderate fee. Wireless and wired high-speed Internet access is complimentary in public areas. Additional amenities include laundry facilities, coffee/tea in the lobby, and complimentary newspapers in the lobby. The 83 air-conditioned guestrooms at Cinema - an Atlas Boutique Hotel include safes and coffee/tea makers. Rooms are equipped with flat-screen TVs with cable channels and pay movies. All accommodations provide desks and phones. Bathrooms offer shower/tub combinations, hair dryers, and complimentary toiletries. Housekeeping is offered daily. 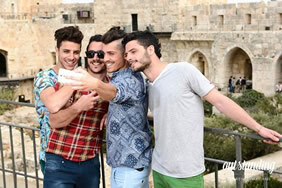 The Eyal Hotel is located in Shamai St., which is just off Ben Yehuda St. The property has recently been renovated and this project has allowed for the implementation of advanced technologies in order to ensure that the hotel will be environmentally friendly. The Eyal Hotel offers 68 newly refreshed rooms with modern amenities and perfectly-finished design. 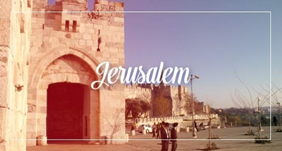 The hotel includes, among other facilities, sublevel guest parking (Subject to availability), event and dining halls, a spacious solarium with an ecologically-designed wall, comfortable living room furnishings and a magnificent urban view over the center of Jerusalem. Hotels new dining hall, is a comfortable place to enjoy delicious food, served in both the mornings and evenings. Experienced chefs prepare healthy and fresh meals that are both kosher and mouth watering. Breakfasts consist of fresh cheeses, fruits and vegetables, scrambled eggs, a variety of warm dishes, homemade marmalades, freshly baked breads and a selection of Coffees .The dining hall is lined with views of downtown Jerusalem. All rooms include a modern bathroom with bathtub/shower, hair dryer and other amenities. Guests enjoy national calls free of charge, USB sockets for mobiles and tablets, and dedicated personal service by a reliable and professional staff. 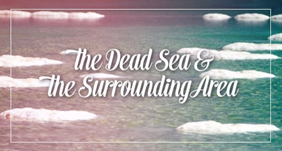 • 6 overnights at the mentioned hotels on Bed and Breakfast Basis.